Roomba 690 vs 890 – Which is the best model? 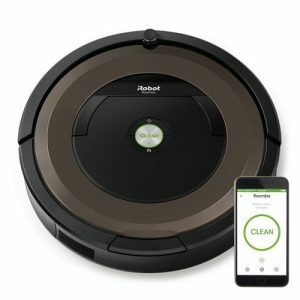 The Roomba 690 and 890 were released at the same time, and the highlight was the Smart connectivity and Alexa compatibility. Today, the duo is among the bestselling Smart robot vacuums. But then, there is a huge difference in their prices with the Roomba 890 costing around $200 more. Spending $200 more doesn’t seem a great idea because both vacuums have Smart features. However, the Roomba 890 has several extras, and that’s reason enough to declare it a winner this early. However, the big question is, are the extras worth the $200? That’s what we are about to find out. Today, we have decided to put the Roomba 690 in a contest with Roomba 890 to see which the best Roomba is in 2018, both regarding performance and value for money. But just before we go further, here is a short overview of the two models. Roomba 690 vs. 890: What’s the best choice? The 690 is now considered an entry-level robot vacuum cleaner, but then, it is distinct from the rest of these cheap brands. The Roomba 690 is the crème of the 600 Series, and the significant addition is the Wi-Fi for Smartphone App operation as well as Alexa compatibility. These two are the significant improvements from the earlier model, Roomba 650. This robot vacuum has been designed to suit a range of cleaning needs; from hard floors to carpets and even pet messes. I recommend the Roomba 690 if you have hardwood floors, hard floors, pets and light to medium pile carpet. On heavy carpet, it is inefficient because of the average suction power. But with some unique features like Dirt Detect and Virtual Walls, it is still a worthy Roomba. The Roomba 690 retails at around $350 which makes it one of the cheapest Roombas available. Perhaps the only cheaper model is the Roomba 650 which is often out of stock. But still, the price difference is so negligible that you’d rather add a few bucks and get Roomba 690. However, there are a few things that Roomba ought to have improved on. The navigation is not efficient, and so is the floor mapping. It cleans in a somewhat random pattern, and at the end of the day, it takes longer to clean. To make matter worse, it may skip some spots if you have a large apartment. If you have been keen on the market, you understand that Roomba 890 is very popular because it is affordable and blends some of the features the Roomba 900 Series has. One thing I like about it is the Dirt Detect Series II technology that uses optical and acoustic sensors for better dirt hunting. It also shares the same motor with Roomba 960. However, the fact that Roomba 960 has a VSLAM navigation makes the Roomba 890 inferior. That said, the perfect match for a challenge is Roomba 690 which is in this case inferior to Roomba 890. One of the reasons Roomba 890 is the best in this battle is because of the boosted suction power. The motor delivers 5* more suction power making it able to clean light to medium pile carpets thoroughly. This is unlike Roomba 690 that does well on light pile carpet only and performs averagely on medium pile. Another thing, it comes with a tangle-free extractor so the long Chihuahua hair won’t be a problem. At least for this model, the navigation software has been upgraded. This is not to say that it matches what you find in Roomba 960 and Roomba 980. But at least it will navigate around more precisely and move in a pattern as opposed to random. The Roomba 890 is an excellent robot vacuum. But my only problem is the fact that it has a short runtime. This is a $500 robot vacuum, so I expect it to do more than just 60 minutes. This is because cheaper models under $200 like ILIFE A4s can do well over 120 minutes. Also read: Ecovacs Deebot N79s vs Eufy Robovac 11plus: Which is the best? 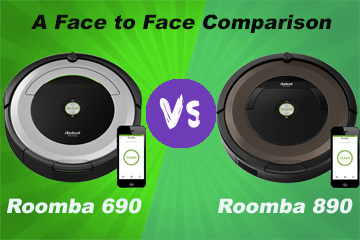 Now, it right about that time we compare the Roomba 890 and Roomba 690 head-on to see what features each offer. To get a good picture of what to expect from the Roomba 690 and Roomba 890, we decided to test them with some of the common household dirt. We used flour, sugar, rice, Cheerios, sand and kitty litter. Here is how the two Roombas compared. Most vacuum cleaners have no problem with hardwood floors as long as the bristles are gentle. Roomba 690 did an excellent job here, vacuuming 100% of the dirt we tested it with. The only challenge was perhaps the tiniest particles of the flour that stuck on the floor leaving a shade of white. This model also performed exceptionally on hardwood floors. This time around, all the dirt was vacuumed including the flour. The extra vacuum power ensures that even the tiniest flour particles are picked up. That said, you want to buy the Roomba 890 if you have a hardwood floor because of the detailed vacuuming. The performance ion carpets greatly varied depending on the type of carpet. We tested the Roomba 690 on light pile, medium pile and also heavy pile. On light pile, the problem was sugar and flour only, but all the other dirt was vacuumed entirely. On the medium pile carpet, sugar, flour, and kitty litter were not thoroughly cleaned. Finally, when it came to heavy pile, the Roomba 690 was overwhelmed and managed to pick up only the large dirt; Cheerios and sand pebbles. A better part of the flour, sugar and kitty litter remained stuck in the carpet fabric. The Roomba 800 Series comes with improved carpet performance because of the new motor that delivers more vacuum power. So, how does Roomba 890 fair on? Cleaning light pile carpet was a buzz for the Roomba 890 as it managed to clear all the dirt with only flour being the problem. This is the same case for medium pile carpet, and even though flour was still an issue, it managed to clear all the other dirt including sugar. Lastly, on heavy pile carpet, it was somehow unable to clear the flour, sugar and kitty litter. But the performance was much better than Roomba 690’s. This robot vacuum did an excellent job picking up the small dog and cat hair as well as the dander and skin flakes. However, the smell of dog urine, as well as the dander, will be a problem if you have allergies. This is because it has an Aerovac system that uses HEPA-style filters which have less efficiency. We also noted that long hairs started tangling the brush. This is the best choice for pet owners for all the reasons the Roomba 690 is not. First, you can note the difference in a newly vacuumed room. The air is fresh and breathable courtesy of true HEPA filters. Long Chihuahua hair didn’t tangle the brush and pick up of dog dirt was satisfactory. Actually, it’s worthy to note that the Roomba 890 offers just the same performance as Roomba 960 and 980. This robot vacuum has a compact design, but it is not among the very best. With a diameter of 13.6-inches and 3.6-inches thickness, iRobot should have done better now that models like Shark ION 720 and 750 are 2.6-inches thin. The Roomba 690 weighs 7.8 lbs. and has been finished in grey and silver. There is nothing much that has changed with the Roomba 890. It still has a 13.6-inches diameter and stands at 3.6-inches high. The only difference is the fact that Roomba 890 is heavier, weighing 8.4 lbs. and has been finished in grey and dark brown. This is quite an old model that uses a 1st Generation motor. The output is not very commendable as it averages just 500-600 Pa. This is the reason why it is not recommended for heavy pile carpets. Regarding operation noise, it produces around 68dB. This model uses a Generation 2 motor that is much more efficient and has higher output. It delivers 5* more air power and consequently, more vacuum power. It averages 900-1000 Pa making it an excellent deal for light to medium pile carpets. What filter system is used in Roomba 690? The Roomba 690 comes with the Aerovac filtration system that basically uses a set of HEPA-style filters. These filters are not as efficient as true-HEPA filters, but still, you will notice a difference. If you have pets, this Roomba is not the best but will still capture some of the common pet-related allergy triggers. What filter system is used in Roomba 890? If you have pets, then the Roomba 890 is the best choice. This is because it comes with the new AeroForce filtration system. It basically uses true HEPA filters this time round, and as you are all aware, HEPA filters are 99.97% efficiency. This is compared to the 85% – 90% efficiency of HEPA filters. This robot vacuum comes with a dual multisurface brush system. It scrubs floors very well and ensures maximum pick up of dirt and dust. The only problem is that it has not been built with anti-tangling function. There is also a pair of side brushes on either side of the vacuum cleaner. It sweeps the path of the vacuum cleaner and directs dirt to the suction area. If you have pets, this is the best choice because of the tangle free dual multisurface extractors. This brush system is also gentle on carpets, and together with the boosted suction, you get all the dirty work done. The Roomba 890 also has a pair of side brushes that sweep the sides and direct the dirt to the brush for agitation and finally, pick up. How many cleaning modes does Roomba 690 have? The Roomba 690 comes with four cleaning modes. Auto, Edge, Spot, and Schedule. The first mode Auto is the primary cleaning mode while Edge is for cleaning the wall edges. On the other hand, Spot mode is for intensively cleaning areas with concentrated dirt. Lastly, we have Schedule that allows you to program the vacuum. How many cleaning modes does Roomba 890 have? The Roomba 890 is not different from the Roomba 690 as it also has the four cleaning modes; Auto, Edge, Spot, and Schedule. Press CLEAN to start cleaning automatically or adjust the cleaning mode on the Smartphone App. Lastly, schedule your preferred cleaning times, and the Roomba will take over from there. One of the problems with Roombas is short runtime. The Roomba 690 can work for only an hour while some cheap robot vacuums can do well over 100 minutes. It has been built with a 2100mAh battery, and even though we expected a lot more, it is not bad for the price. Recharge time is about 2 – 3 hours, but unfortunately, there is no resume function. The Roomba 890 greatly disappoints as it also runs for just 60 minutes. While the Roomba 690 may be excused because it is an old model and again, it is cheaper, there is no justification for Roomba 890’s short runtime. I expect well over 100 minutes for a $500 robot vacuum, but that’s not the state of affairs. It also takes 2 – 3 hours to recharge, and it doesn’t resume cleaning after that. This is quite an old vacuum cleaner so don’t expect so much from its navigation system. Anyway, it comes with the trademark iAdapt 1.0 which is a SLAM navigation. This means it uses sensors for localization as well as a set of obstacle sensors and cliff sensors. In a fairly furnished house, the Roomba 690 has no problem navigating, but when it comes to large and crowded apartments, it might get stuck a few times here and there. Despite being an advanced model, Roomba 890 still uses the old iAdapt 1.0 navigation. So, if your major concern is navigation, you’d rather stick to the cheaper Roomba 690. But there’s something we noted; Roomba 890 was a little bit efficient thanks to the updated software. At least it makes data transmission faster so while the Roomba 690 may take time to stop upon detecting an obstacle, Roomba 890 stops almost immediately. How does Roomba 690 clean? The most important thing for a vacuum cleaner is to plan how it will clean the floor. Roomba 690 uses the iAdapt 1.0-floor mapping and scanning system, but it is not intelligent enough. It moves randomly without any clear pattern no wonder it missed some spots and took longer to clean. How does Roomba 890 clean? I had a lot of expectations from Roomba 890, but it disappointed yet again. It also uses a random cleaning pattern just like Roomba 690, but at least it moves intelligently. The updated software enhances the intelligence of the robot vacuum, and this explains the shorter turnaround time and rarely misses cleaning any spot. If there are areas where you don’t want the Roomba to cross, here’s a fantastic feature; Virtual Walls. It enables homeowners to set boundaries for the Roomba. The technology uses infrared sensors that are transmitted by the Virtual Walls nodes. This model comes with one node included. This model also comes with the Virtual Walls boundary marking function and is also supplied with one node. How I wish iRobot would have provided two nodes now that you are paying $200 extra. If you are really keen on using Virtual Walls, you need to get at least two nodes, one costing around $45. Yes, one of the features the 690 beats the 650 with is Smart connectivity. Roomba 690 is compatible with 2.4 GHz Wi-Fi. It allows homeowners to control the robot vacuum remotely via the iRobot HOME App. We also have voice control, and this enables you to connect the Roomba 690 with Alexa. These are just a few of the many integrations it can work with. Definitely, being a superior model to the Roomba 690, this vacuum comes with Wi-Fi for Smartphone operation and Alexa as well. But unfortunately, for $200 more, there are no extras so you’d instead stick with the cheaper Roomba 690 if you are all about Smart connectivity. How I wish it would have come with extras like Clean Maps and advanced cleaning settings like Roomba 980. The Roomba 690 is cheaper, but the maintenance is a little bit expensive. This robot vacuum comes with a bristle-brush system. The bristles are more susceptible to wear; you will be required to replace them after six months or so. The Roomba 890 is expensive but has cheaper maintenance. This robot vacuum comes with rubber extractors instead of a bristle design. Rubber is more durable and will require replacement after 12 months or so. If you are on a budget, then automatically, the Roomba 690 fits your budget. It costs less than Roomba 890 and still has quite a lot to offer. 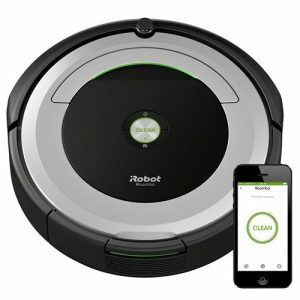 Regarding autonomy, it has the same runtime as Roomba 890, so there’s no need to spend $300 more. Candidly speaking, there is no valid justification for buying an old version when there is an updated one. 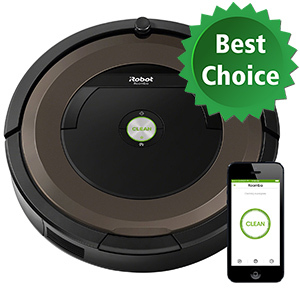 Unless you are on such a tight budget, the Roomba 890 should be number one on your wishlist. To be honest, I wouldn’t mind spending $200 more for these features. 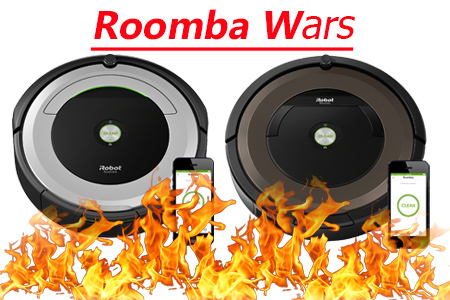 Now, it’s time we give our verdict on what’s the best Roomba between the 890 and 690. Well, the truth of the matter is that Roomba 890 is the best choice; both regarding performance and value for money. With the Roomba 890, you get the new AeroForce cleaning system which marks a shift from the old cleaning technology to the latest high-performance cleaning system. If you really want a reliable cleaner that is worth your money right now, get Roomba 890 because, after a few months, the performance of Roomba 690 will be below your expectations. Three years ago it was the real deal but not today when robot vacuum brands are shifting to HEPA filtration and 2nd & 3rd Generation motors.